File image of a Skytrans Dash 8 Q300 at Sydney Airport in August 2013. 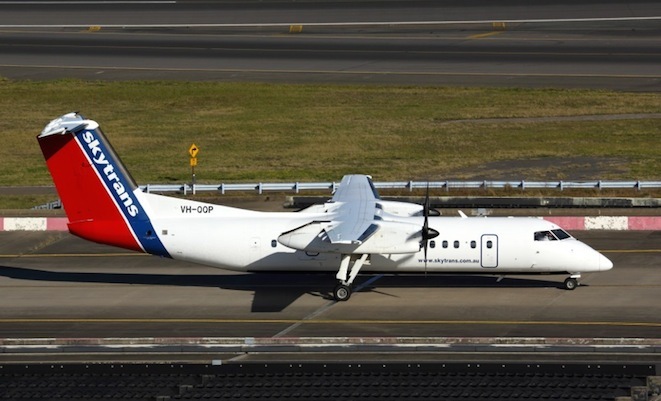 Cairns-based regional airline Skytrans has voluntarily ceased operations with immediate effect from Friday January 2, just a day after marking its 25th anniversary. In a statement posted on the airline’s website, managing director Simon Wild said the low Australian dollar made Skytrans’ business case for operations in 2015 unsustainable. The airline, which lost three Queensland government subsidised regional air routes to Regional Express with effect from January 1, had been planning to continue operating on a much reduced scale, having already made 121 staff redundant. However, Wild said that business case was developed based on a USD-AUD exchange rate of 91 cents, whereas the Australian dollar has recently been trading as low as US 81 cents. “In addition to the currency challenge it now appears likely that we will have competition on our Cape routes with an inevitable price war – a war where the only winner would be the airline with the deepest pockets. It would be a war I would not be prepared to enter as it would have jeopardised staff entitlements. We have been talking with possible investors and have pursued these interests diligently, but unfortunately every road pointed to unsustainability and as such we could and would not entice investors to a business we did not believe ourselves had a strong future. The airline says it paid $2 million in staff entitlements to 121 staff made redundant in November and early December, and that a final $2 million was paid to remaining staff on Friday, “and again I confirm that all superannuation payments are up-to-date,” Wild said. Read Simon Wild’s complete statement on the Skytrans website here. Is it just RPT in North Qld? What about their FIFO charter flights? What about Maroomba services which are operated by Skytyrans Dash-8s? How sad to see honest and decent business people go out of business. Very sad for the industry. Congratulations to the Newman government for putting a local Queensland company out of business so it could save a few bucks. No disrespect to Rex, which is a fine regional airline, but some government decisions defl logic. Well done Simon for putting your staff first and paying their entitlements and not siphoning all the money like many business owners do. There’s an old saying…..Evolve or perish. My words will anger some readers but I must share my opinion. In the Australian airline industry we like to rely on government contracts and want everything the cozy way. Why does Skytrans not go into different markets? Why not offer RPT flights from say Bankstown or similar secondary airports where the catchment area is large enough to support an operation? If the business does not come to you, you go where the business is. Saying that a number of government contracts have been cancelled and now we collaps is nothing else than being lazy (or should I use the Australian term for lazy, laid-back). Expecting that the government will be the prime customer was a good business model for a while, these days are over. Aviation in any nation is based on the US$ and fuel prices effect every operator, not just Skytrans.The consumer wants cheaper airfares, so offer them cheaper airfares with your Dash-8. Be creative, conduct mixed (cargo and pax) flights. Fly major routes, not just remote communities. There are many other options, not just government contracts. Give me 3 of your aircraft and its crew, I show you how the business will generate revenues and profit. But only sitting and waiting for honey to be given does not work anymore. I am not saying to take silly risks but Simon, look further than remote QLD, you will see there is plenty of work out there for Skytrans. Last advice, put the operations on hold if you must, do not shut down. If neded wait for better times, they will come. Competition is a funny thing. I recently had to travel from SYD to Toowoomba, just for the day. Skytrans operated a direct flight, without any competition (this was before Qantaslink flying to Wellcamp), but barely had one return flight per day. It was cheaper for me to fly Jetstar return to the Gold Coast & hire a car for the day, & fly back that night, than it was to fly Skytrans direct to Toowoomba. But REX is by no means the bad guy in Skytrans story either. They seem to be cleaning up fairly well. They moved onto the Newcastle – SYD route just before Aeropelican / Brindabella went pear-shaped as well, & now have that to themselves too. a good comment bob ,what’s the old comment DONT PUT YOUR EGGS ALL INTO ONE BASKET I feel sorry for the towns that no longer have a RPT service but us passengers expect a lot for very little .